A new display exhibiting a Civil War pistol linked to tragedy and murder in Daviess County has been acquired. The revolver is believed to be that used by the notorious Union Capt. 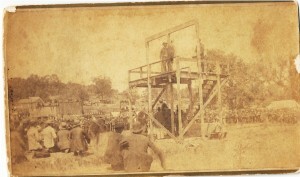 William Brumfield who was shot to death on the south side of the Gallatin business square in the bitter aftermath of the war. Plans are underway to eventually display the revolver at the Daviess County Visitors’ Center located at the historical 1889 Squirrel Cage Jail in Gallatin. Research by David Stark provides the background which marks the pistol’s place in local history. In August, 1862, Capt. William Brumfield was elected to command Company D 33rd Reg. EMM (Enrolled Missouri Militia). Brumfield was from Washington Township (his grave site is still marked by a headstone at the Old Scotland Church). Brumfield also served as a private in the 43rd Reg. MVI (Missouri Volunteer Infantry) from September, 1864, until war’s end. In both periods of service he was under the command of Lt. Col. William Flint, who later was the Daviess County Sheriff at the time of Brumfield’s death in July, 1868. Capt. 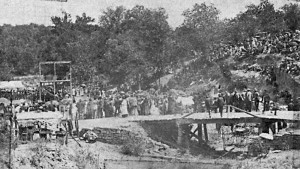 Brumfield’s early period of service was at Breckenridge in neighboring Caldwell County. The Union held control in Daviess County but rebels were active to the east and south. Brumfield was relieved from duty after 180 days and his Company D disbanded in early 1863. According to Mr. Stark’s research, it appears that Brumfield and some friends, upon their own initiative, murdered Confederates and men who helped the rebel cause in the eastern part of Daviess County. In April, 1863, Jonathan Oxford was taken from his home and murdered at the Clear Creek Church. George Crews and Thomas Peery were ambushed near Breckenridge in September, 1863, by Brumfield and his friends. In August, 1866, William Crews was murdered at the Clear Creek Church by “Brumfield and Nickols.” Mr. Stark suggests that Nichols may have been Lt. Mounce Nickols or one of his sons from Jackson Township. 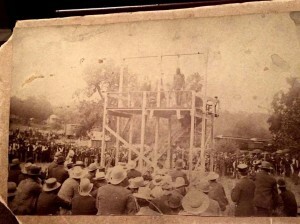 It was reported that Crews was murdered because he planned to avenge the death of his brother, George, and friend, Thomas Peery. On July 27, 1868 ? about 18 months before Capt. 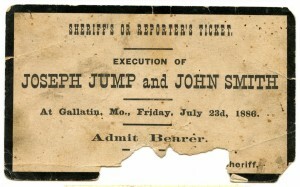 John Sheets was murdered by Frank and Jesse James during the savings association robbery in Gallatin ? Capt. Brumfield was shot and killed south of the courthouse by Pvt. Solomon Tomlin. Tomlin had served in Brumfield’s command at Breckenridge for 68 days in 1862-63. Unlike Capt. Sheets, Brumfield was not liked nor respected. 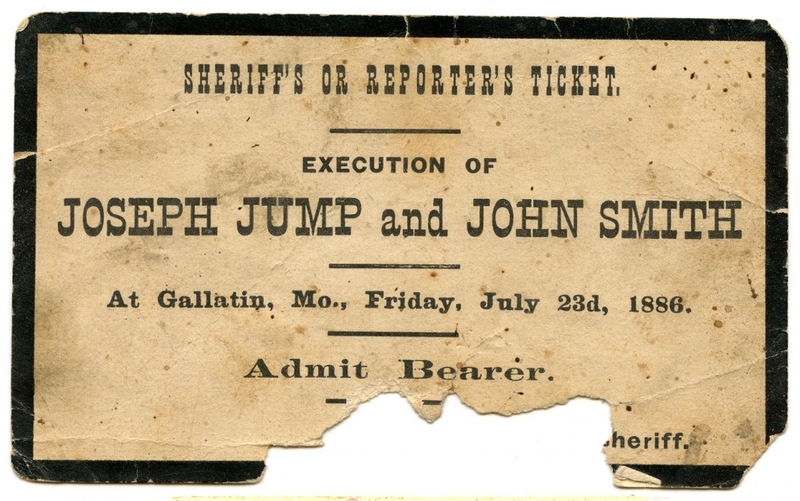 In November, 1868, a grand jury issued a bill charging Tomlin with murder in the first degree but Tomlin was never tried in court. The particulars of the charge were written in a humorous language, and Tomlin had long since left the county with his family. Brumfield had a murderous instinct and bullying manner which made people afraid. It seems that on a raid in Buchanan County, Tomlin and Brumfield had appropriated several horses. In the division of the property, the two men exchanged bitter words which crescendoed until Brumfield declared he would kill Tomlin. On the day of Brumfield’s murder, Brumfield went to Tomlin’s home located two miles south of Gallatin. He intended to call him out. Tomlin’s wife, Julia, told Brumfield that her husband had gone to Gallatin. Brumfield vowed that she would never see her husband alive again. He also told her that he would be back that night to hang Tomlin’s hat on the gate post. Brumfield learned in Gallatin that Tomlin was hiding in Lt. Benton Miller’s store located on the south side of the business square. Brumfield exited from the courthouse yard through the south gate, going directly toward the store. Tomlin was watching and saw Brumfield approaching with revolver in hand. The store owner ordered Tomlin to leave. Tomlin, armed with a double-barrel shotgun, stepped out of the store and shot Brumfield in the chest before Brumfield could raise his revolver. That revolver eventually came into the possession of J. Paul Croy. The Manhattan 5-shot cap and ball revolver is marked by Serial #13201. If you have pictures of any of those mentioned in this summary of Mr. Stark’s research or information relating to this firearm or story, please respond by notifying the Daviess County Historical Society through Gallatin Publishing Company, 660-663-2154.